Nicole Noutsios published the article “An Interview with Brett Redfearn of the SEC” in IR Update, a magazine specializing in investor relations issues. Nicole Noutsios was interviewed in the article “In Transition: Leveraging Anxiety Into Opportunity” in IR Update, a magazine specializing in investor relations issues. Nicole Noutsios and Erik Bylin published the article “Perception Studies: A Good Foundation to Plan 2018” in IR Update, a magazine specializing in investor relations issues. Nicole Noutsios was quoted in the article “Telling the IPO Story” in IR Update, a magazine specializing in investor relations issues. Nicole Noutsios published the article “Benchmarking Your IR Program” in IR Update, a magazine specializing in investor relations issues. Nicole Noutsios spoke on a webcast, Leveraging Different Perspectives For Your Career in IR, for the virtual chapter. Nicole Noutsios moderated a panel, Effectively Communicating Your Story Pre and Post Listing, NIRI SF and SV Pre-IPO Workshop. Nicole Noutsios published the article “BlackRock Focus on Company-Shareholder Engagement” in IR Update, a magazine specializing in investor relations issues. Nicole Noutsios was awarded the 2015 - 2016 NIRI Individual Chapter Leadership Award for her contribution to the NIRI San Francisco Chapter. Nicole Noutsios published the article “The Activist Perspective” in IR Update, a magazine specializing in investor relations issues. Nicole Noutsios hosted a panel on Analyst Day Best Practices, with some amazing speakers, for NIRI SF. Nicole Noutsios published the article “Shareholder Activism: The Rising Impact on Companies” in IR Magazine, a magazine specializing in investor relations issues. 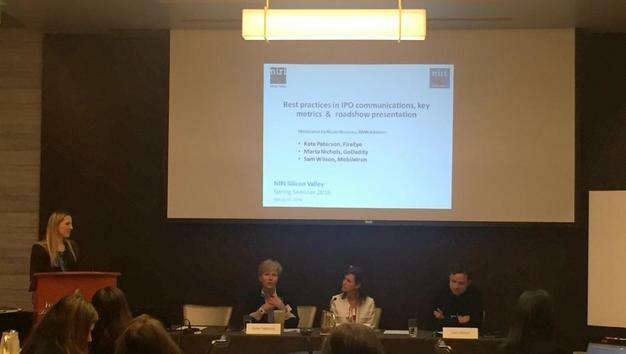 Nicole Noutsios hosted an IPO communications best practices panel, with some amazing speakers, for NIRI SV & SF. Nicole Noutsios presented on a panel hosted by Directors Roundtable & SF NIRI on key issues facing Boards, IROs & C-Suites. Nicole Noutsios was interviewed in the recent IR Update on investor relations consulting trends. Nicole Noutsios conducted a perception study with senior investor relations officers to survey the change in Board-Shareholder interaction. The study found that investor relations officers are adding significant value by assisting boards with key issues that may impact the company. Nicole Noutsios published the article “When Investors Ask to Speak to Directors” in IR Update, a magazine specializing in investor relations issues. Nicole Noutsios published the article “A Year-Round Strategy For Proxy Season” in IR Update, a magazine specializing in investor relations issues. The firm welcomes Avelina Kauffman, as a SVP of Investor Relations. As a former equity research team member of Lehman Brothers and Merrill Lynch, Avelina brings broad knowledge of the software sector and almost twelve years of Investor Relations and Wall Street experience to NMN Advisors. Erik Bylin and Nicole Noutsios published the article “Expanding Your Stock's Global Ownership” in IR Update, a magazine specializing in investor relations issues. Nicole Noutsios, Principal, spoke at NIRI Silicon Valley Annual Conference, Crisis Communications Panel. Nicole Noutsios, Principal, spoke at the 2006 NIRI National Annual Conference, Ethics, IR and Protecting Yourself from Liability. Nicole Noutsios published the article “The New World: Expensing Stock Options” in IR Update, a magazine specializing in investor relations issues. Nicole Noutsios published the article “Gaining Visibility for Small Caps” in IR Update, a magazine specializing in investor relations issues. The firm won two Annual Report awards for BusinessObjects in 2004. Nicole Noutsios published the article “Integrating Financial Messaging into Employee Communications” in IR Update, a magazine specializing in investor relations issues.